As long as we were teaching, we knew our notes and software were being used by our students. Now that we have retired, we have to analyze our web logs to see who is using the site and software. We are in the process of writing LiveCode scripts to scan through our logs and do some analysis. Here are some preliminary results for the month of February, 2018. The first objective was to try to purge the logs of all web bots, spiders and crawlers. We were left with 20% of the original lines in the logs. I suspect that the bots/spiders/crawlers are indexing the PDF files in the RESOURCES section, which allows many users to find them in searches. Good in some aspects, but many users might not explore the rest of the site. All the RESOURCES content may be the reason that a search for “ReactorLab” or “Reactor Lab” puts our site at the top of page 1. We were left with 3200 unique visitors after the purge, or simply “visitors” henceforth (unique IP addresses). This number roughly agrees with the Visitor Maps results in the NOW section. These visitors were from 107 different countries. The top five countries with the most activity were the US, India, Philippines, Ukraine, and the United Kingdom. 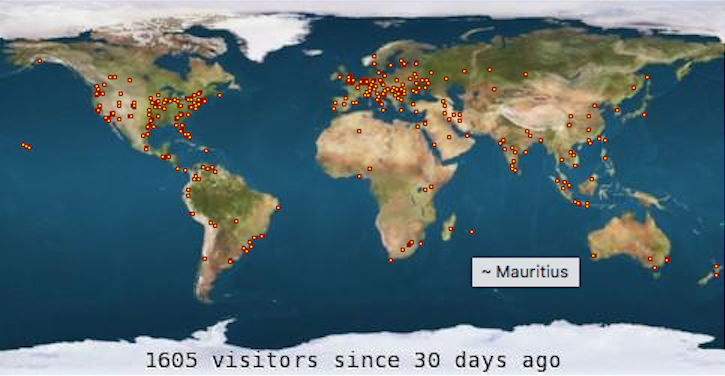 Of those 3200 total unique visitors, 2300 visitors from 96 countries used pages in the RESOURCES section of the site: 370 from 56 countries used the Matlab section, 1100 from 74 countries used the undergrad CRE Notes section, and 530 visitors from 66 countries used the Grad CRE section. There were 59 visitors who downloaded the desktop software, and 86 visitors who ran the desktop software AND went “online.” There were six users of the Web Labs. Again, these numbers are for the month of February, 2018. So far, I am pleased with what I am finding. I would be delighted to hear directly from you via email to . Thanks. This entry was posted in Web Site on March 8, 2018 by Richard Herz.